Need a semi-homemade treat for your Christmas celebration? Or something to keep the little ones busy on Christmas eve? These Nutter Butter Santas (no, they are not babies in diapers) are quick, easy and fun. I got the idea and directions from this blog post. Hers are a bit cuter than mine, I think. 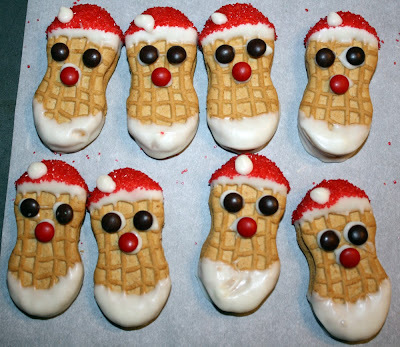 Nutter Butter Santa Claus cookies. Dip one dipped end into the red sugar (for the red part Santa's hat), leaving some white showing, and lay it onto your parchment paper. I put some of the melted stuff into a Baggie and snipped a corner ... but you could use a squeeze bottle or pastry bag with writing tip. Make three dots for his face (two for the eyes and one for the nose) and then one on the edge of the hat (for his tassle). Press the appropriate candies on the nose and mouth. When you're done, put the tray in the fridge for about 15 minutes to harden and you're done! These made me giggle, especially the part about the diaper!